The story mapping process facilitates discussions during participatory workshops and the information sharing through a graphic visualisation. Mobility4EU uses a powerful visualisation technique of story mapping. The story mapping process facilitates discussions during participatory workshops and the information sharing through a graphic visualisation. In this way project partners, associated partners and external stakeholders can easily follow up the entire process. These workshops validate, expand and enrich the work done in the project. The final graphic representations of the individual parts of the storymap will therefore contain the results from both the workshop and the topical work in the project. Outcomes of the storymap will be published on the project website and will serve to keep the community updated on the project results and the advancement toward the action plan. 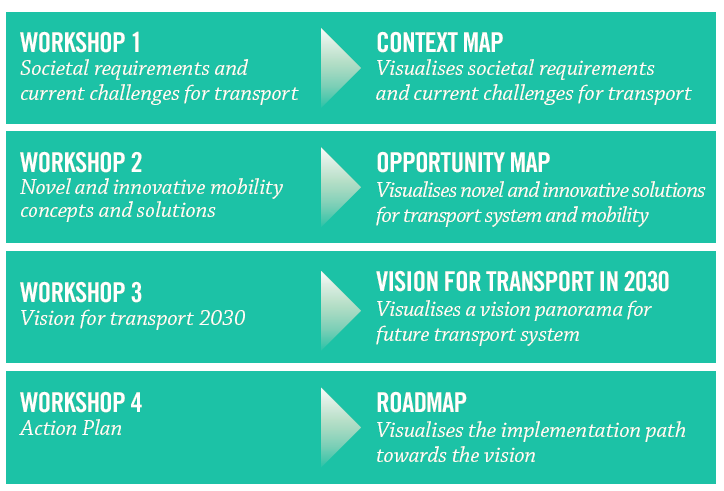 EU project establishing a future vision of a transport system in 2030 in Europe.